Chocolate melangers are expensive. What is an affordable tool to conche the chocolate? It’s very bitter. How does the “percent” of this chocolate compare to real chocolate? Can the chocolate be tempered? After seeing this recipe on ChefSteps, I knew I had to make it. The ingredients are readily obtainable: coffee beans, cocoa butter, granulated sugar, kosher salt, liquid soy lecithin, and vanilla beans. You also need a melanger to conche and refine the ingredients into a silky smooth texture. But at $500, a chocolate melanger is too expensive for such a specialized piece of equipment in a home kitchen. Chocolate Alchemy is a great resource for learning about how to make chocolate at home. They found the $180 Premier Wonder Table Top Wet Grinder to be an excellent alternative to expensive melangers. 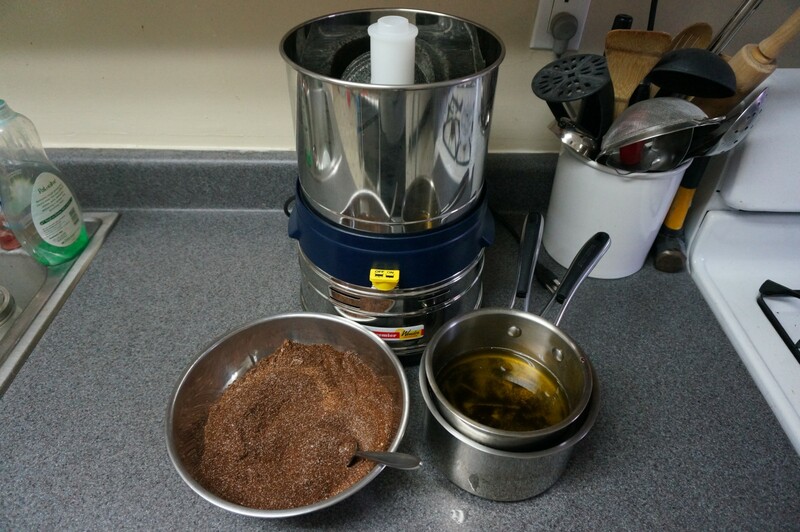 Although you may be tempted to buy the Ultra Dura+ Table Top Wet Grinder which looks exactly like the Cocoatown, the Cocoatown has additional ventilation to prevent the belt-driven motor from overheating during the extended 24+ hour run time. In contrast, the Premier’s direct drive motor is a workhorse that stays cool through the entire process. 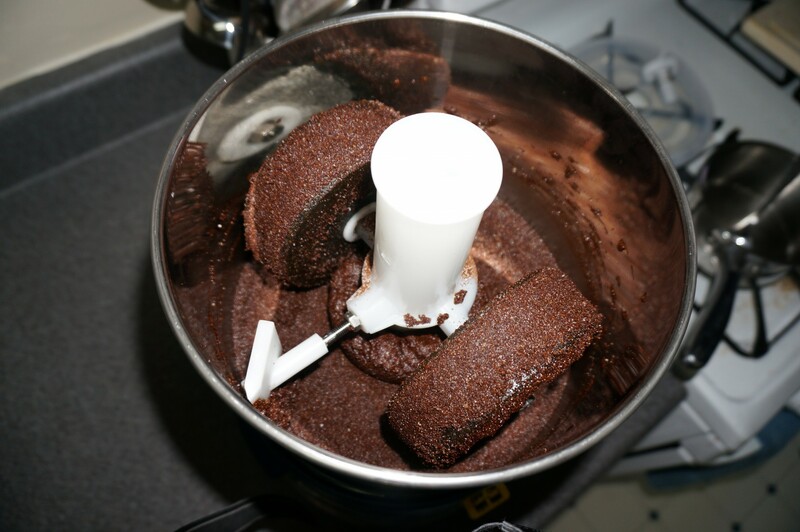 Note: before first use, clean the grinder by running it with plain oil and sugar. This will break in the stones and remove any residual dust. What percent is this chocolate and how does it compare to real chocolate? A chocolate bar’s percentage indicates how much cocoa butter and cocoa mass there is by weight. A 70% chocolate bar could be 50% cocoa butter/20% cocoa solids or 35% cocoa butter/35% cocoa solids. Let’s breakdown a chocolate recipe from Root Chocolate: 802g cacao nibs (chocolate liquor), 283g sugar, 50g cocoa butter, 0.9g soy lecithin. A Ghanaian cocoa bean is between 50-54% fat, in line with the FDA’s definition of 50-60% cacao fat for chocolate liquor. We’ll use 54% in the calculation below. This yields a 75% chocolate bar with a 43% cocoa butter/32% cocoa solids split. 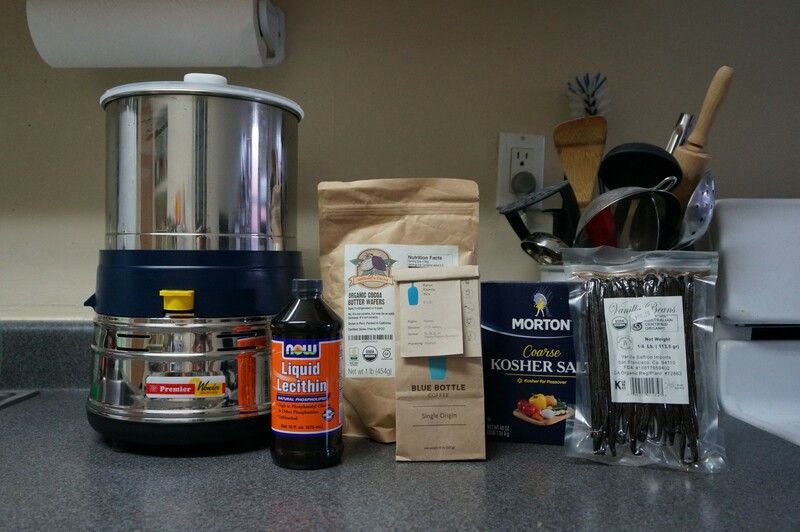 Now let’s consider dark matter, which is 400g coffee beans, 300g cocoa butter, 200g sugar, 3g salt, 1g soy lecithin, 14g vanilla beans. A coffee bean is between 7-17% fat. We’ll use 15% in the calculation below. This yields a 76% bar with a 33% cocoa butter/7% coffee fat/37% coffee solids split. Most commercial dark chocolates are around 70%. Dark matter already starts as a very high 76% dark chocolate. It then increases the bitterness compared to regular chocolate by reducing the cocoa butter and adding in sharp tasting coffee oil and solids. In the next iteration, I would experiment with a 65% chocolate by adding more sugar and cocoa butter. I would also consider adding milk solids to make milk dark matter. Adding sugar and cream will hopefully make it more palatable, just like regular coffee. ChefSteps’ recipe did not say anything about tempering the chocolate. Tempering manipulates chocolate’s temperature to ensure proper cocoa butter crystallization, which is necessary to create good snap, gloss, and texture. Chocolate alchemy provides a good explanation of the tempering process here. 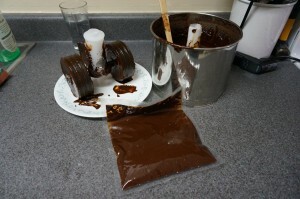 Pour the chocolate from the grinder into a plastic bag and seal it. 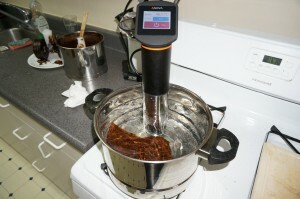 Put the bag into a 115F water bath and allow the chocolate to melt. This melts all of the cocoa butter crystals. Cool the water bath down to 81F and let the chocolate cool to this temperature. You’ll notice this is right at the Form IV crystal melting point from the Chocolate Alchemy tempering description. Raise the temperature to 90F. While the chocolate is coming up to 90F, massage the bag to ensure even mixing. 90F is just under the Form V melting point, so you at the end of this process you should have all Form V crystals in the chocolate. I had mixed results, as the dark matter didn’t have much gloss or snap. 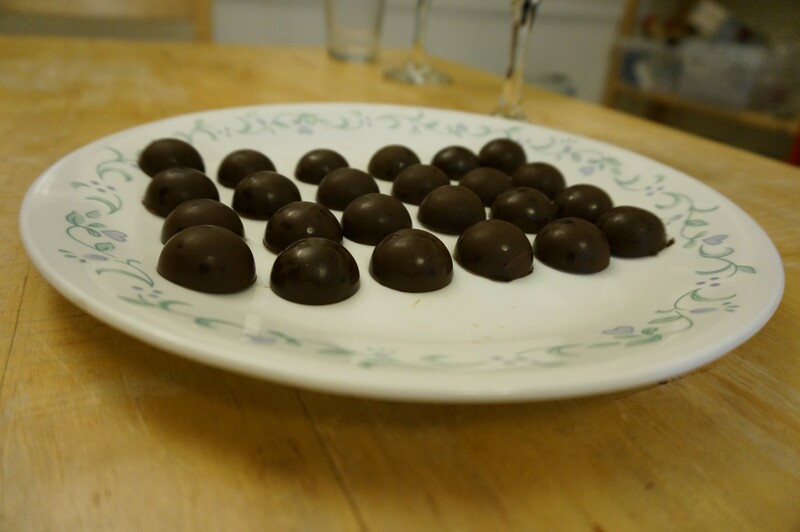 How might using coffee beans affect the tempering process? Cocoa butter’s main fatty acid composition is listed below. It has a high melting point (34-38 C) because its component fatty acids have high melting points. Stearic, palmitic, and oleic acid are relatively linear molecules, which allows them to pack tightly together and have close intermolecular interactions. By comparison, coffee oil’s main fatty acid composition is listed below. Coffee oil has a low melting point (8-9 C) because it’s majority linoleic acid, which has a “bend” in the molecule that creates weaker intermolecular interactions. Dark matter reduces the cocoa butter by 10% and adds 7% coffee fat. Adding coffee fat should lower the mixture’s melting point, which would throw off all of the temperatures used in traditional tempering guidelines based on pure cocoa butter. The addition of unsaturated linoleic acid may also affect the mono-, di-, and tri-glyceride composition, which is responsible for cocoa butter’s hardness (described here, here, and here). I’m not a chemist or food scientist, so I’m only guessing, but the addition of coffee oil may prevent the usual crystal polymorphism, which would mean it would remain soft, somewhat like coconut oil at room temperature. Please email me if you know how this works. All that said, let’s walk through how I made it. 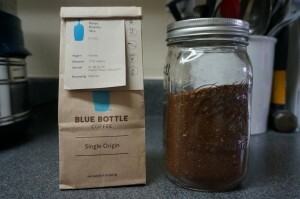 I used Blue Bottle Kenya Kiambu Yara single origin beans for this recipe. I am not a regular coffee drinker, so I can’t appreciate a single origin bean; I just wanted to sound like a coffee snob while making this recipe. Melt the cocoa butter down, but don’t let it get too hot. I improvised a double boiler from two nested pots. Cocoa butter has a low melting point, so you can just use hot water from the tap without the stove. 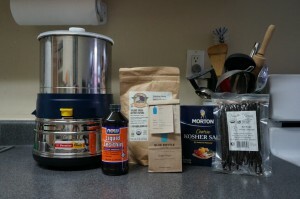 ChefSteps says to add chopped vanilla beans to the cocoa butter. I’ve used chopped vanilla beans in ice cream before; it resulted in unappetizing chewy chunks of bean. I was skeptical the grinder would grind the fibrous bean, so I scraped the seeds and infused them in the melted cocoa butter. Add the soy lecithin to the cocoa butter. Combine the dry ingredients in a bowl. 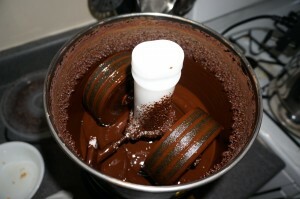 Add the liquid cocoa butter into the wet grinder first. Let it run for a few minutes to lubricate the grinding stones. Slowly add the dry ingredients until well incorporated. Scrape down the sides every few hours to ensure even grinding. After 24 hours of continuous grinding the chocolate turns into a shiny, silky smooth liquid chocolate. The whole house smelled of wonderful fresh roasted coffee. Taste testing the liquid, I thought it was very flavorful. It only became unpleasantly bitter when it solidified, perhaps because the amount consumed was much higher than a small lick of the spoon. I sealed the chocolate in a plastic bag to temper. Tempered using the sous vide method as described above. The plastic bag is a convenient piping bag. 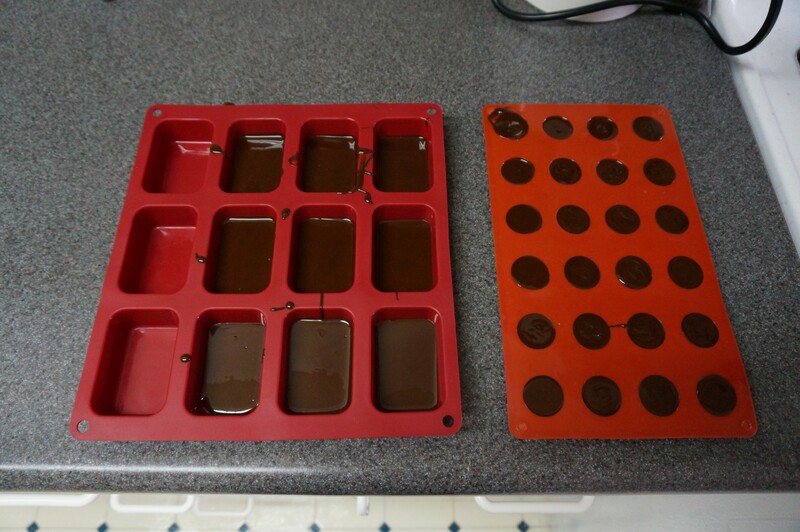 I cut a corner and piped the chocolate into some silicon molds. Unfortunately, the tempering was poor. The chocolate was only semi-glossy and didn’t have good snap. In addition to the coffee oil issues outlined above, perhaps I didn’t give it enough time in the 81F and 90F stages to let the cocoa butter crystallize. If I were to remake this, I would want to learn more about how the coffee oil is affecting the crystal polymorphism of cocoa butter so I could adjust the tempering accordingly. Alternatively, I might just use it in liquid form and enrobe strawberries so that the sweet berries can offset the bitter coffee. I would also experiment with increasing the sugar, cocoa butter, and milk solid percentages. A pure piece of dark matter as currently described is too bitter by itself. 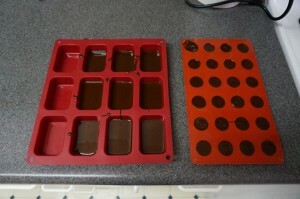 However, I am more interested in applying this technique to make other forms of chocolate. There are many ingredients that have similar flavor profiles to roasted coffee, like roasted barley or roasted brown rice. I’d like to make a genmaichacolate, using conched genmai tea. The upside of genmaicha is that it wouldn’t introduce any other oils with different fatty acid profiles, so the tempering guidelines would still hold.